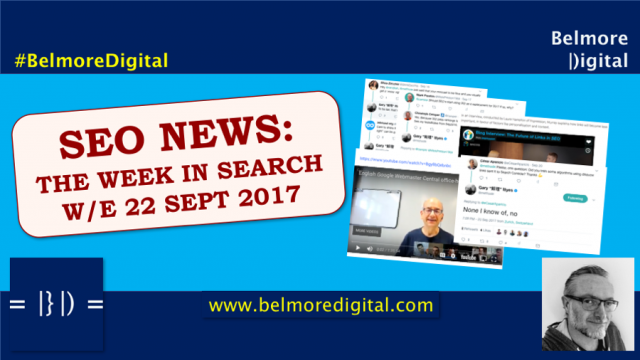 I enjoyed writing this week’s SEO News & Updates. This week: Google likes the algo monitoring tools – kinda. 301 redirects don’t dilute PageRank. Or do they. Bing says links still important. Who Bing? 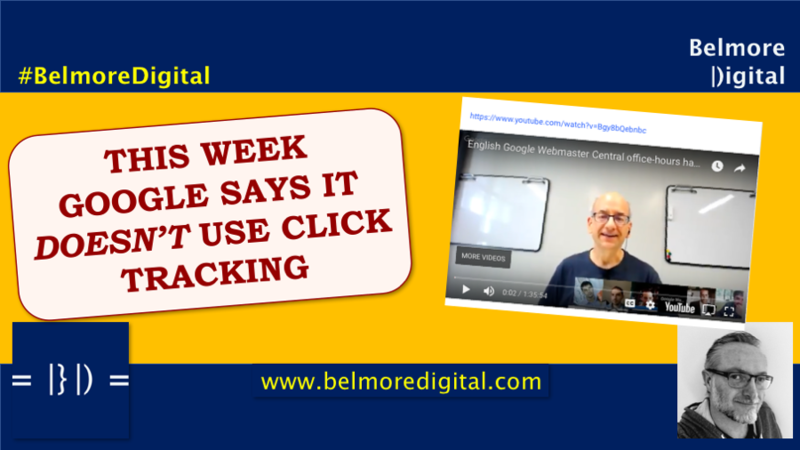 This week Google says it doesn’t use click data for search rankings. Sigh. As well as some toptastic SEO Bits & Pieces. Read it all right now. These days there are a whole heap of SERP monitoring tools giving daily updates into algorithm shifts. In the past Google has derided these as “scrapers”, since they scrape the results looking for changes, sometimes multiple times a day. Gary Illyes from Google has now said that some of them / most of them are right some of / most of the time – notwithstanding the fact that a broken clock is right twice a day. Generally, this isn’t a surprise, most algorithm updates should be visible, but I do think that the tools miss out on a variety of ways to utilise and market their information. Keep on relying on Mozcast and other tools to show you when there is an algorithm update. Remember that your traffic and analytics are a good indicator of updates, but you may just be overtaken by events. If you are pursuing good SEO with a well-rounded strategy and good quality content techniques, then in most instances algorithm updates are things that happen to other people. Remember that the tools do miss updates, or over / understate the importance of them, simply because they do not have a wide enough view of the data, and their statistical methodologies are not robust enough. Click here to contact me to discuss using forecasting tools for benefit, or designing an update-safe SEO Strategy. I like the forecasting tools, I think they do a good job, but I wouldn’t want to rely on one absolutely, as they are not accurate enough. Essentially, these search ranking monitoring tools measure volatility in the search results. The search results are in constant flux, but the issue is how much flux, and whether that level of flux is an indicator of an update. You get the sense that Google is playing games with webmasters when it says things like “Moz does a good job, but doesn’t catch everything”, and presumably, also reports false positives. Perhaps if Google took a more open and transparent “Release Notes” stance, then we wouldn’t have this kind of inaccurate, but “the best we’ve got” tool scenario. Google has been pretty insistent the last few years that 301 (or any other redirect) don’t dilute Page Rank. Well, they had to get out the “Don’t be silly” hammer again when the topics reared its head once more. Lots of people are very sure it dilutes PageRank, but also not sure what other signals it might dilute. 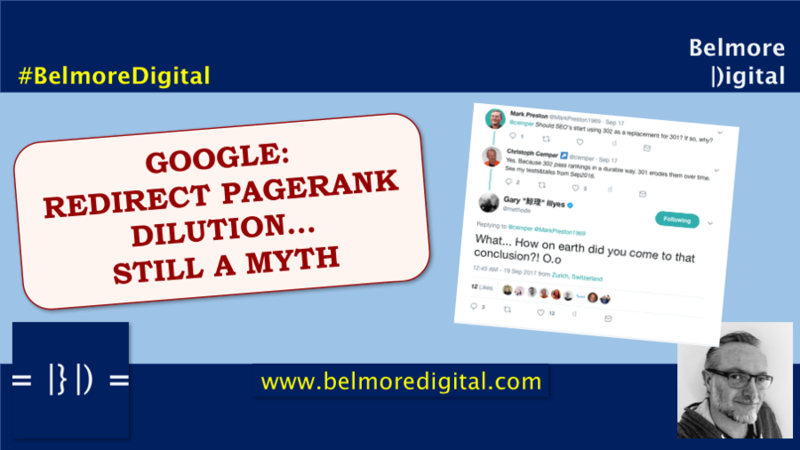 PageRank is not diluted by redirects, says Google. However, it does leave the door open for other “signals” to be diluted. Redirect away! 301 or 302, it doesn’t seem to matter to Google in terms of PageRank. It may matter in terms of equity. Remember there is a maximum of 5 hops which Google will follow. Make sure you redirect 1 to 1, like for like wherever possible. to maintain as much equity the page accumulates from Google’s signals. Click here to contact me to discuss how to best manage redirects for transfer of as much equity as possible..
For an awfully long time, I’ve been talking about equity, or value for a URL rather than PageRank. In most instances, if you redirect 1 to 1, like for like, from a to b, then all value is transferred across. If you redirect from a “red widgets” page to a completely unrelated “yellow fish” page, then almost no value is transferred across. This is because value is likely to be related to relevancy in these areas (and relevancy is more important than any other value any SEO talks about). That may come from on-page signals, or it may come from the accuracy of the pages sending signals. In many ways, this makes absolute sense. Google has moved very much to a “current state” view of the world. If you’ve changed URLs and have redirected them, but the content is the same, why wouldn’t Google still want to surface that content in search. rather than applying some arbitrary algorithm to dilute a mythical number? Value is found in the relevancy of pages and content linking to your page, and the content residing on the page surfaced. Remember that. John Mu on Google+ (He’s the only one). Remember Bing? Well, their European Marketing Manager has said that links are still important for ranking. But that they will decrease over time somewhat as “personalisation and user context take over”, especially for local search. All this will be based on big data, machine learning and artificial intelligence no doubt. Keep creating content which will attract links. Links are not going away anytime soon. Keep building / generating / acquiring quality, editorial links, with varied anchor text. Think about whether you think Bing will actually make a success of contextual search or not. Click here to contact me to discuss creating links in a sustainable manner. Honestly, sometimes I feel like the search engines are disappearing up their own fundament. They hate links, but considering they are the building blocks of the web, they cannot get away from using them in their algorithms. Instead, they’d love to use cohort led contextual algorithms to decide what it relevant at a point in time, or place in the world. They’d love to, but they know that would produce utter rubbish results for users, since most cohorts tend to get dominated by a banal majority who may or may not be right. You just have to look at the quality of adverts you are served to know that cohort led search results would be terrible. If they can’t get something right which is back-pocket critical, what makes you think they would get it right for the front pocket? Still, it makes for good PR and gets Bing mentioned again, so objective achieved. I am interested in Bing’s take on Voice search, however. When Facebook, or Amazon want to take on voice search, outside of their own narrow confines, I wonder where the technology and results will come from. Makes you wonder, eh? It’s funny this was discussed this week by Gary Illyes, because I was just turning something like this over in my mind. In a carefully worded statement, Google said they didn’t process webmaster disavow files for link spam as that would just be playing into black hat hands. Hmmmmm. I think this might be one of those “half-accurate” answers. There’s not really a lot of action to take here, aside from trying to get a better understanding how Google works. Oh, and not bothering with disavow files, as Google has the “ignoring links” thing down pat. 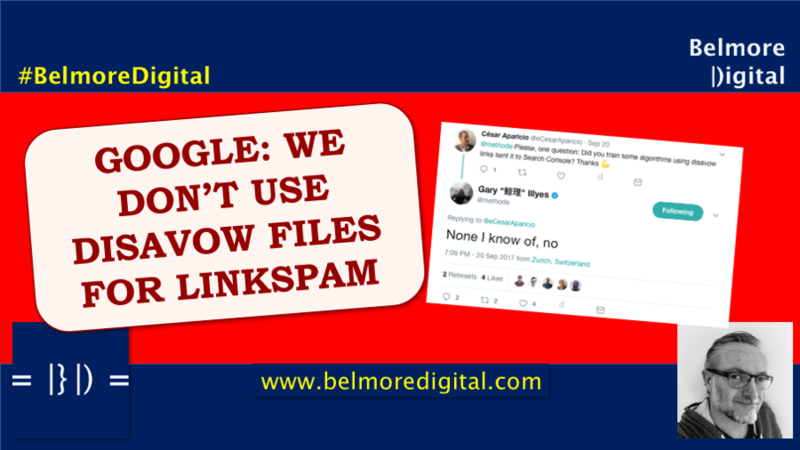 So, perish the thought that Google might use information submitted by webmasters to create a link spam methodology, and don’t use disavow files. Click here to contact me to discuss Google’s link spam activities and how it catches people. You’ll have to pardon my mild doubt here, but a number of years ago, Google (basically) said it couldn’t cope with link spam any more and it would just de-rank you for rubbish inbound links. Then, you were able to create and submit a disavow file based on your backlink profile which may or may not be rather shonky. And voila, a few years later, no more need for disavow files, Google has this link spam thing cracked again. I was beginning to wonder if the whole disavow thing wasn’t one of the largest social hacking experiments undertaken. Get webmasters to report bad links and at-scale you can start to identify patterns of bad links. You don’t need to use the disavow files themselves, you just need to crawl pages mentioned in them. Like all spam activity, there are always innocent examples of spammy behaviour, and there are spammy examples of innocent behaviour. I would be very surprised if Google didn’t use some of the data in some way to create a better link spam combatting machine, even after throwing out the black hat / negative SEO false matches. Gary Illyes denying disavow files used on Twitter. In a frustrating, left-hand right-hand moment, Google now denies it uses click-data for search rankings, despite what they said last week. They really are tying themselves in knots over this and it’s a little embarrassing for them. They do admit that maybe, possibly, potentially, they use something like this kind of data for testing. But not anything else, oh no. Sigh. It’s almost time to think that Google doesn’t always know what it is doing. It’s also almost time to think that its representatives sometimes don’t have every answer, or knowledge of every situation. It’s likely time to think Google does use some sort of click-tracking in its results. The best you can do to influence it, is to be the definitive, quality answer for a search result, so the user doesn’t have to search again, and again. Click here to contact me to discuss creating great query-answering content. Let’s get something clear. Google has always user tested everything. Every colour, every block, almost every result. The thought that they don’t use click-testing in some way, manner, or form, is a long way beyond daft and approaching outright stupidity. Is it every SERP? Maybe, maybe not. Is it every query? Probably not. But, you can bet that the most popular queries will have been tested for performance and back. It would be really silly not to. Of course, some of the learnings would go back into the algorithms, and some would be tested against live people, that would make a great deal of sense. What doesn’t make any sense is that they wouldn’t do any click testing at all. Rumours of an update #735. Saturday September 16th, there were big mutterings of an update. And spikes on a lot of the monitoring tools Google had been praising. All quietened down the next day, so nobody was any the wiser really. Google vs EU #10056 – now proposing “rival links” as part of its solution for its little $2.7 billion EU fine issue. Regrettably, these were rejected in a previous attempt to settle the dispute. But who know? Second time lucky! Sometimes, if Google has issues pulling your page for Fetch and Render, it could be indicative of crawling issues. And sometimes not. Non-helpful discussion this. Find Crawl Index. Googlebot doesn’t yet talk HTTP2 because it doesn’t need to. It’s so flipping fast it’s unbelievable. I’m a bit surprised by this. You would have thought Google would want to use HTTP2 mainly in case there were any issues caused by it. Clearly not though. And finally, Gary Illyes has come right out and said that Responsive websites “don’t really need to worry about the mobile first index”. Phew. 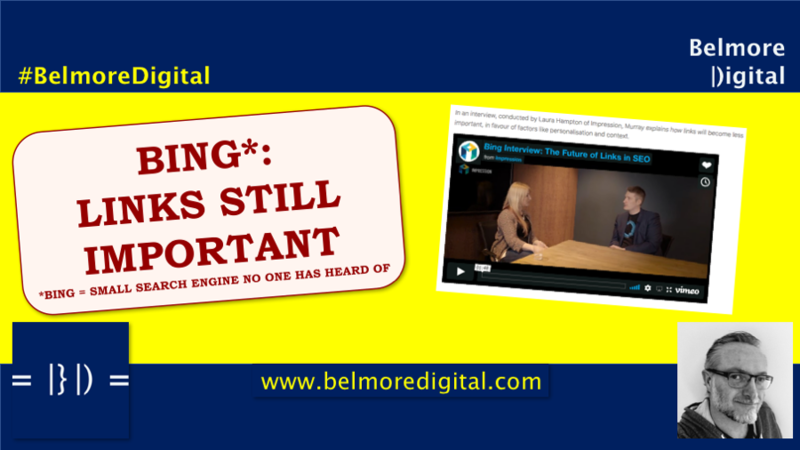 Click here to contact me to discuss any of these SEO Bits and Pieces further. Google admits it kind of likes the algorithm monitoring tools, after calling them scrapers a couple of weeks ago. 301 redirects do not dilute page rank, can we agree on this now? Bing (who they?) say links are still important. Google’s algo don’t look at Disavow files. They just completely ignore the treasure trove of link spam data they asked for. This wee click data isn’t used for search rankings. Make your mind up Google. And some really rather fun SEO Bits and Pieces.